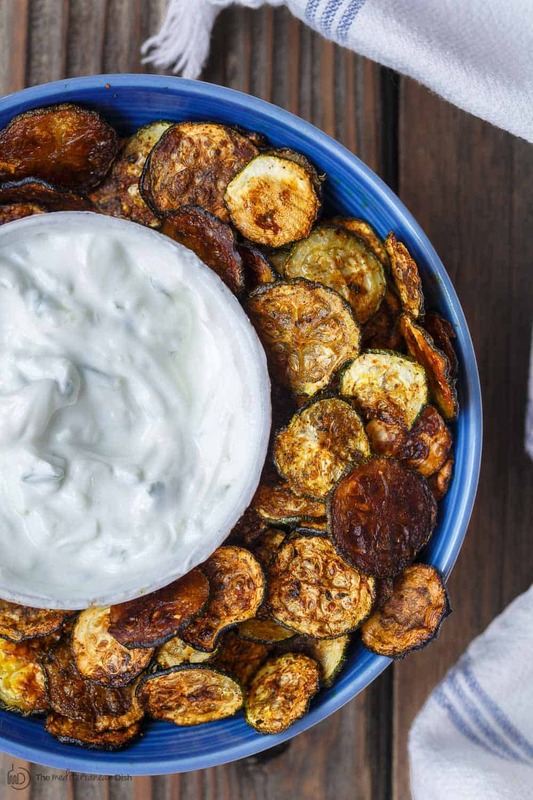 This zucchini chips recipe will change your snack-time routine. Just a few tips ensure the best, crispy baked zucchini chips! Green is a prominent color in my cooking. And it seems zucchini is a prominent ingredient, particularly during the summer months. From a simple grilled zucchini salad (adorned with herby greens); to a quick skillet zucchini or zucchini boats for the perfect side. And when I’m feeling fancy, then it’s mom’s stuffed zucchini. The other day, I had a few zucchini tucked in my vegetable drawer, so I decided to use them in a healthier, low-calorie snack: zucchini chips! First, the most obvious step is to slice zucchini thinly and uniformly. To achieve this, I always use a mandoline. Secondly, and this is so important, do everything you can to rid the zucchini slices of moisture. You can do two things here: 1) once zucchini slices are arranged on paper towel (the moisture has to be absorbed by something, right? ), sprinkle them with kosher salt. The salt will draw moisture out through osmosis. 2) Top salted zucchini with another layer of paper towels AND a sheet-pan weighted with something (I used a cutting board). And LEAVE for 15 to 20 minutes so that the salt and weight will work together to draw as much of the moisture out as possible. Bake the zucchini slices in a lower-degree heated oven. It’s a slow bake that ensures crispy zucchini chips without burning. Simply salted zucchini chips make a great snack. But if you’re like me and want to jazz things up a bit, you use other seasonings such as this harissa. Harissa is an all-natural North African spice blend with three types of mild chili along with sumac, caraway, fennel, cumin, coriander, garlic and peppermint. Totally optional but worth a try! 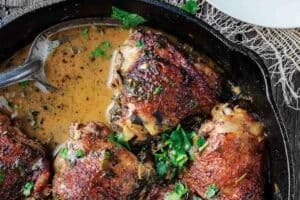 You can also use a sprinkle of za’atar or smoked paprika to change things up. 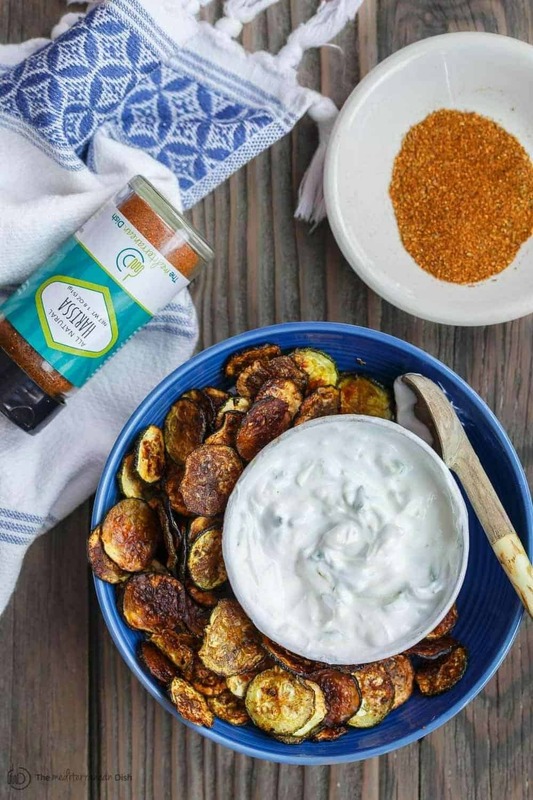 If you like to dip your chips, I highly recommend this easy Greek Tzatziki Sauce! This zucchini chips recipe will serve up to eight people, and i hardly doubt the chips will last long enough to store. But, you can store them in zip lock bags for a couple of weeks in a dry pantry. Perfectly crispy baked zucchini chips! Tasty, healthy, low-calorie, vegan, gluten-free snack that everyone loves. 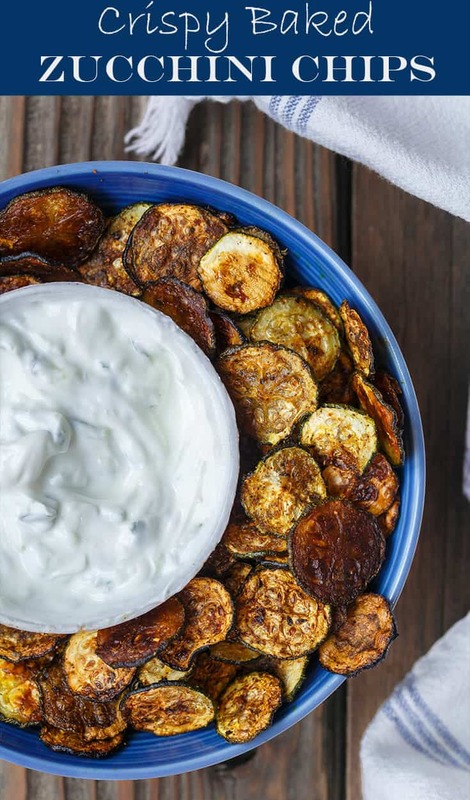 And if you like to dip your chips, make tzatziki sauce to go along! 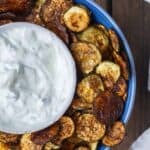 If you plan to have a dip for your zucchini chips, make Greek Tzatziki sauce according to this recipe. Cover and refrigerate for now. For zucchini, again make sure they have been sliced thinly and evenly to about 1/8-inch rounds. Using a mandoline is the best way to do this. Spread zucchini slices on large sheets of paper towel. Sprinkle zucchini with kosher salt, then cover with more paper towel. 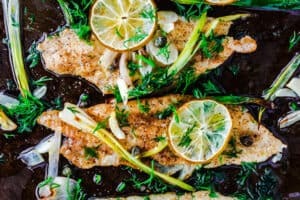 Now, place a sheet pan on top of covered zucchini and add a plate or a cutting board to weigh the sheet pan down (the idea here is to squeeze out any excess water from zucchini.) Leave for 15 to 20 minutes. Preheat oven to 245 degrees F.
Line large sheet pan (or two sheet pans if needed) with parchment paper. Brush parchment lightly with extra virgin olive oil. Arrange zucchini slices on top of parchment in one single layer. Bake in heated oven for 1 1/2 to 2 hours until crisp and golden. If some of the zucchini chip are still damp, remove the ones that have crisped up, and return sheet pan to bake until all zucchini is nice and crispy. 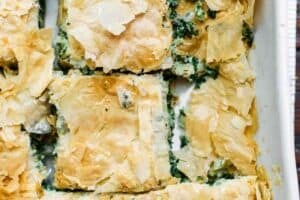 Serve warm or at room temperature with a side of Greek tzatziki sauce. Storing instructions: you can store zucchini chips in zip lock bags for a good couple of weeks. SAVE! 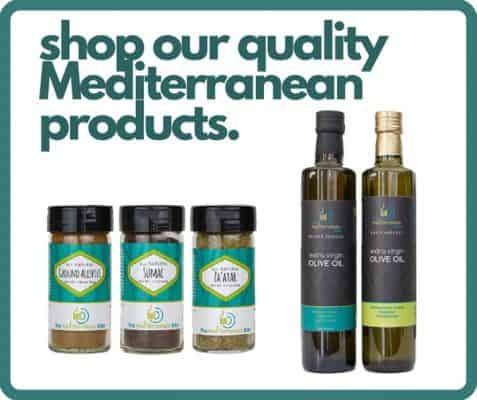 Try our Greek EVOO Bundle and our Exotic 4 Spice Bundle! Or create your own 6-pack or 3-pack from our all-natural or organic spice collections! Great taste, and crispy too. I used the 3 mm slicing blade on my old Cuisinart to make thin slices. Then salting and squeezing the moisture out of the slices seemed to be the key to getting the right texture. I spread harissa sauce on some slices and sprinkled parmesan cheese on the rest; both were excellent. Making again today with the rest of a large bag of zukes. That’s great, Ginny! So glad to hear it! These were amazing! I forgot to oil the parchment paper, so many of mine stuck. In addition, I didn’t have many spices but used a 2-2-1 ratio of paprika, chili powder, and garlic powder that was delicious. Best enjoyed with goat cheese! It happens, Mary 🙂 Glad you enjoyed these chips! These are delicious!! I’ll def make again! Wonderful, Kristen! So glad to hear it! Wow, interesting post. Zucchini chips are my all time favorite but I have always purchased it from stores. 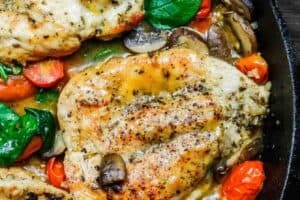 Thanks for sharing this recipe as I am very excited to prepare it by myself and serve my family. 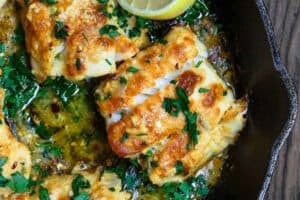 Keep posting such yummy recipes. Oh my goodness I could definitely get into eating these chips. Love the low and slow bake! Such a great low carb snack idea! 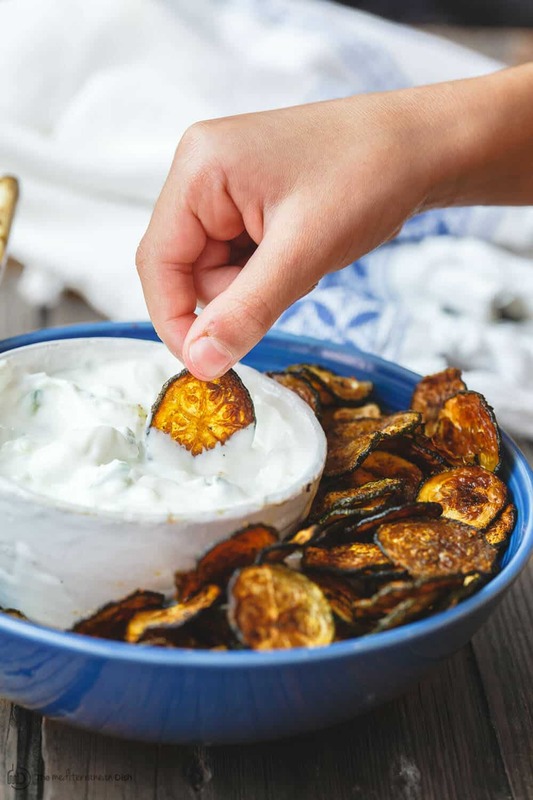 The perfect snack – love the tzatziki for dipping too! Taztiki is my-go to these days! Such a great healthy snack! I love zucchini chips! I want these!